Ten Speed Press, 9780399579073, 232pp. Inspired by nature's colors, textures, and patterns, design icon Erica Tanov uses her passion for textiles to create beautiful, timeless interiors that connect us to the natural world. 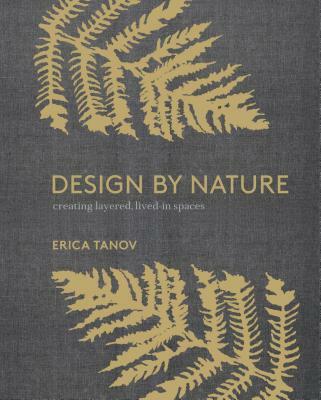 Now, in her first book, Design by Nature, Tanov teaches you how to train your eye to the beauty of the natural world, and then bring the outdoors in—incorporating patterns and motifs from nature, as well as actual organic elements, into simple ideas for everyday decorating and design. ERICA TANOV launched her eponymous label in 1990 after earning a BFA in fashion design from Parsons School of Design. Her collections of clothing and lifestyle goods, sold at her three boutiques in California and her online shop, epitomize relaxed luxury. Her work has been featured in Vogue, Elle Decoration UK, Undecorate, and The New Bohemians. Actresses including Maggie Gyllenhaal, Tilda Swinton, and Vera Farmiga have donned Tanov's enduring pieces. “In this highly original study of design and nature, Bay Area clothing designer Tanov describes her artistic process as bringing what Proust called “new eyes” to her familiar California surroundings. The book’s five sections—based on wood, weeds, water, dirt, and decay respectively—show readers how to find decorating inspiration right in their own backyards. Tanov follows her obsession with ferns and “their furry brown fronds and delicate green tendrils” through the creative process as her adulation transforms into fodder for textile designs of clothing, home furnishings, and wallpaper. Later in the book, the author pairs a photograph of a redwood forest floor strewn with pinecones with a picture of a daybed tossed with pillows in earth tones and graphic patterns. This creative juxtaposition, like many others within these pages, is a testament to nature’s hand and Tanov’s eye in creating relaxed, inviting rooms. The book combines personal musings, essays, and artist profiles with 100 full-color photographs by Minh Ngo. It will be treasured by a diverse readership whose tastes run from British cult interior designer Ilsa Crawford to American transcendentalist Henry David Thoreau." “Opening up Tanov's book feels like going to the natural hot springs--there is something very cleansing, refreshing, and almost spiritual. But, her book is not only inspiring in a poetic way, it is rich with ideas and takeaways. She's inviting us on a hike through her imagination and it's both compelling and extraordinarily beautiful."